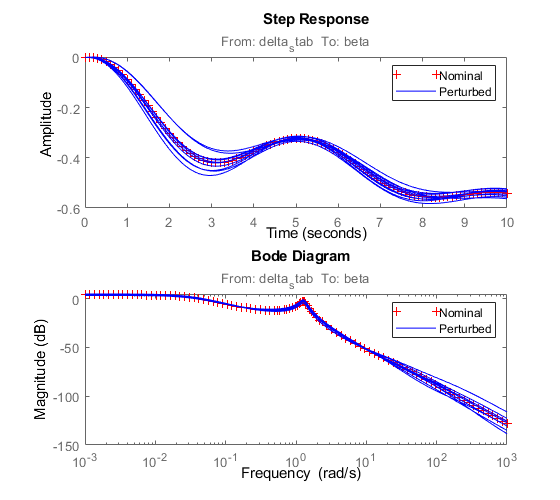 This example shows how to use mu-analysis and synthesis tools in the Robust Control Toolbox™. 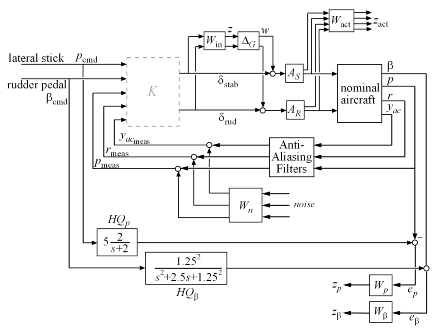 It describes the design of a robust controller for the lateral-directional axis of an aircraft during powered approach to landing. The linearized model of the aircraft is obtained for an angle-of-attack of 10.5 degrees and airspeed of 140 knots. The illustration below shows a block diagram of the closed-loop system. 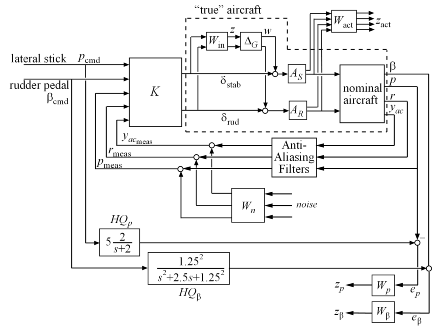 The diagram includes the nominal aircraft model, the controller K, as well as elements capturing the model uncertainty and performance objectives (see next sections for details). 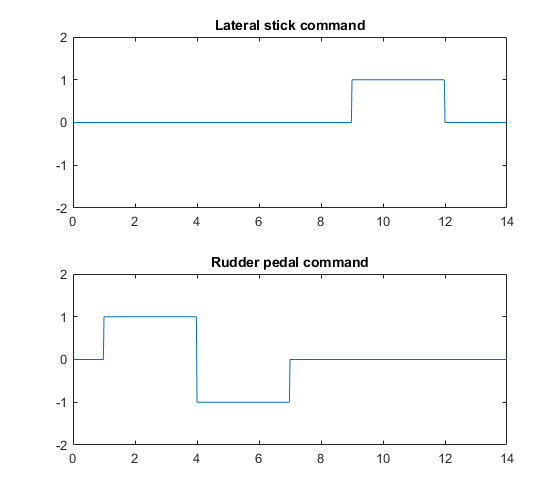 Decoupled responses from lateral stick p_cmd to roll rate p and from rudder pedals beta_cmd to side-slip angle beta. The lateral stick and rudder pedals have a maximum deflection of +/- 1 inch. 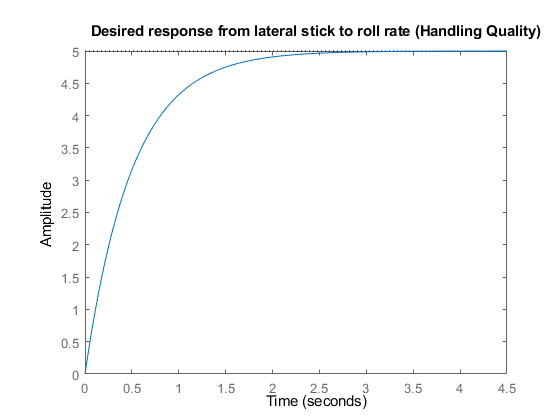 Figure 2: Desired response from lateral stick to roll rate. The aircraft handling quality response from the rudder pedals to the side-slip angle beta should match the damped second-order response. 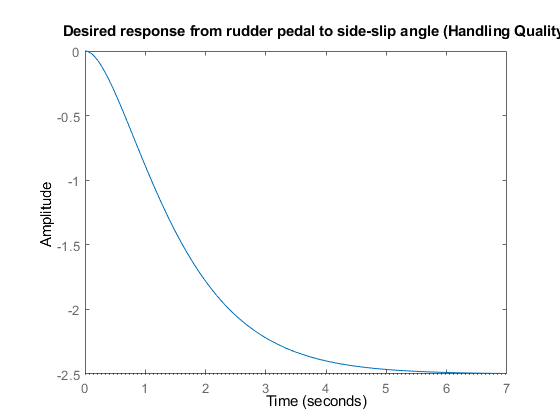 Figure 3: Desired response from rudder pedal to side-slip angle. The stabilizer actuators have +/- 20 deg and +/- 50 deg/s limits on their deflection angle and deflection rate. The rudder actuators have +/- 30 deg and +/-60 deg/s deflection angle and rate limits. H-infinity design algorithms seek to minimize the largest closed-loop gain across frequency (H-infinity norm). To apply these tools, we must first recast the design specifications as constraints on the closed-loop gains. We use weighting functions to "normalize" the specifications across frequency and to equally weight each requirement. To capture the limits on the actuator deflection magnitude and rate, pick a diagonal, constant weight W_act, corresponding to the stabilizer and rudder deflection rate and deflection angle limits. 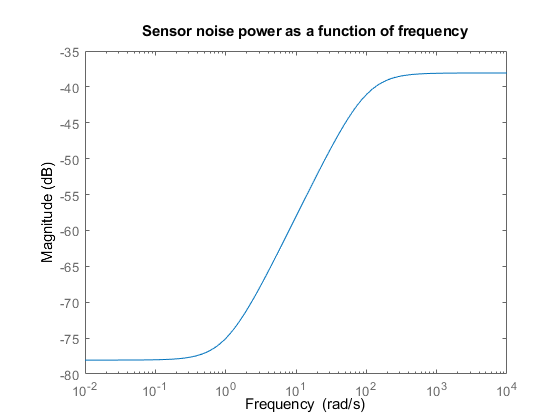 Use a 3x3 diagonal, high-pass filter W_n to model the frequency content of the sensor noise in the roll rate, yaw rate, and lateral acceleration channels. The response from lateral stick to p and from rudder pedal to beta should match the handling quality targets HQ_p and HQ_beta. This is a model-matching objective: to minimize the difference (peak gain) between the desired and actual closed-loop transfer functions. Performance is limited due to a right-half plane zero in the model at 0.002 rad/s, so accurate tracking of sinusoids below 0.002 rad/s is not possible. Accordingly, we'll weight the first handling quality spec with a bandpass filter W_p that emphasizes the frequency range between 0.06 and 30 rad/sec. 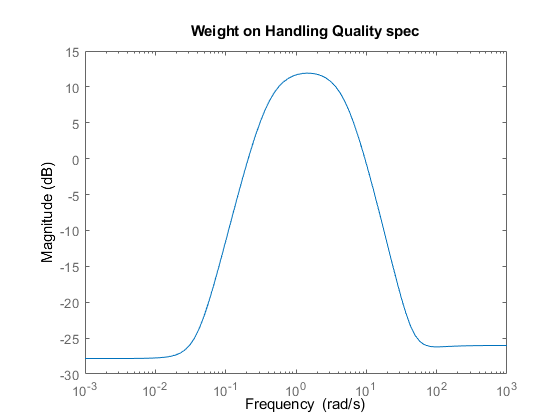 Figure 5: Weight on handling quality spec. Here we scaled the weights W_act, W_n, W_p, and W_beta so the closed-loop gain between all external inputs and all weighted outputs is less than 1 at all frequencies. Two control inputs: differential stabilizer deflection delta_stab in degrees, and rudder deflection delta_rud in degrees. Three measured outputs: roll rate p in deg/s, yaw rate r in deg/s, and lateral acceleration yac in g's. One calculated output: side-slip angle beta. where x = [v; r; p; phi], u = [delta_stab; delta_rud], and y = [beta; p; r; yac]. The complete airframe model also includes actuators models A_S and A_R. The actuator outputs are their respective deflection rates and angles. The actuator rates are used to penalize the actuation effort. The nominal model only approximates true airplane behavior. To account for unmodeled dynamics, you can introduce a relative term or multiplicative uncertainty W_in*Delta_G at the plant input, where the error dynamics Delta_G have gain less than 1 across frequencies, and the weighting function W_in reflects the frequency ranges in which the model is more or less accurate. There are typically more modeling errors at high frequencies so W_in is high pass. 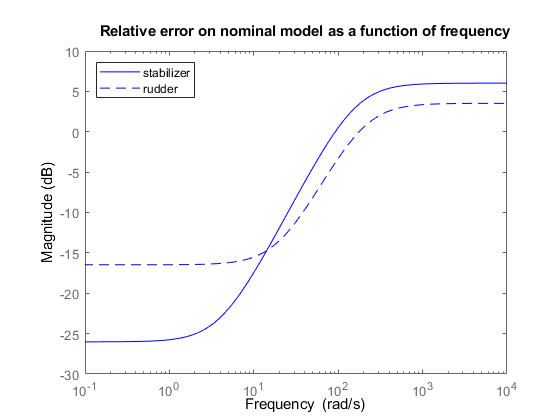 Figure 6: Relative error on nominal aircraft model as a function of frequency. Uncertain continuous-time state-space model with 8 outputs, 2 inputs, 8 states. Type "Plant_unc.NominalValue" to see the nominal value, "get(Plant_unc)" to see all properties, and "Plant_unc.Uncertainty" to interact with the uncertain elements. We can analyze the effect of modeling uncertainty by picking random samples of the unmodeled dynamics Delta_G and plotting the nominal and perturbed time responses (Monte Carlo analysis). For example, for the differential stabilizer channel, the uncertainty weight w_1 implies a 5% modeling error at low frequency, increasing to 100% after 93 rad/sec, as confirmed by the Bode diagram below. Figure 8: Step response and Bode diagram. Proceed with designing a controller that robustly achieves the specifications, where robustly means for any perturbed aircraft model consistent with the modeling error bounds W_in. First we build an open-loop model OLIC mapping the external input signals to the performance-related outputs as shown below. Figure 9: Open-loop model mapping external input signals to performance-related outputs. To build this model, start with the block diagram of the closed-loop system, remove the controller block K, and use connect to compute the desired model. As before, the connectivity is specified by labeling the inputs and outputs of each block. Figure 10: Block diagram for building open-loop model. Uncertain continuous-time state-space model with 11 outputs, 7 inputs, 26 states. Type "OLIC.NominalValue" to see the nominal value, "get(OLIC)" to see all properties, and "OLIC.Uncertainty" to interact with the uncertain elements. Here hinfsyn computed a controller kinf that keeps the closed-loop gain below 1 so the specs can be met for the nominal aircraft model. Next, perform a mu-synthesis to see if the specs can be met robustly when taking into account the modeling errors (uncertainty Delta_G). Use the command dksyn to perform the synthesis and use dksynOptions to set the frequency grid used for mu-analysis and the number of D-K iterations. Here the best controller kmu cannot keep the closed-loop gain below 1 for the specified model uncertainty, indicating that the specs can be nearly but not fully met for the family of aircraft models under consideration. What is the worst-case performance (in terms of closed-loop gain) of each controller for modeling errors bounded by W_in? The wcgain command helps you answer this difficult question directly without need for extensive gridding and simulation. 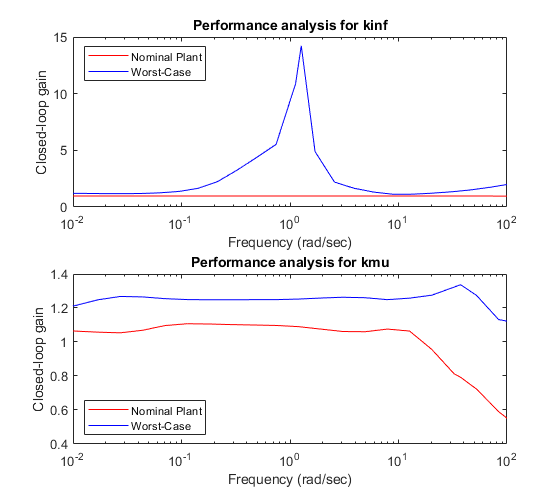 The first plot shows that while the H-infinity controller kinf meets the performance specs for the nominal plant model, its performance can sharply deteriorate (peak gain near 15) for some perturbed model within our modeling error bounds. 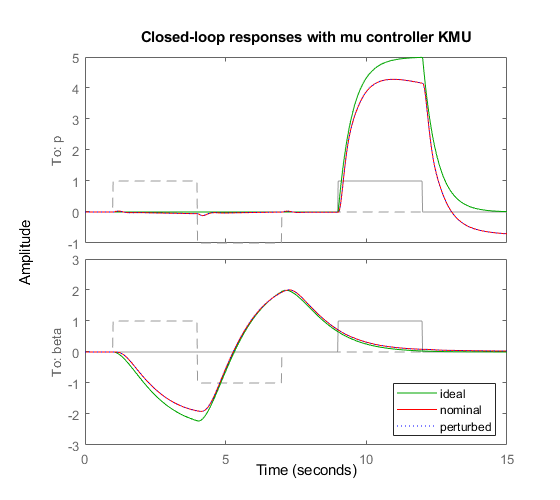 In contrast, the mu controller kmu has slightly worse performance for the nominal plant when compared to kinf, but it maintains this performance consistently for all perturbed models (worst-case gain near 1.25). The mu controller is therefore more robust to modeling errors. The closed-loop response is nearly identical for the nominal and worst-case closed-loop systems. Note that the roll-rate response of the aircraft tracks the roll-rate command well initially and then departs from this command. This is due to a right-half plane zero in the aircraft model at 0.024 rad/sec.